Greg KH, one of the Kernel developers and also the author of Linux Device Driver Development Kit Project has invited a Free Linux Driver Development for everybody who has problem of making a driver available on Linux operating system. His offer is not only for specific devices, but all kind of devices. The company only needs to provide a specification of how the device should work and then the Linux Device Driver community will try to develop that driver based on the spec given. The company may also give an email address of a technical engineer that will give support in the development process. Every working driver is being promised to be included in the main kernel tree, so it will likely be available on the next kernel release and since Linux kernel supports a lot of CPU type, it will be likely be available to those kind of CPU as well. I think this project will have a good future and if it's successful, then almost every devices available on store can be used in every platform (Windows, Macintosh, and also GNU/Linux), thanks to good cooperation of the company who gave the specs and community who works on that driver. Driver for printer will also be supported as well, so i think there's no reason for not using Open Source in the future. In Firefox, there's an accessibility option which is quite useful, which is "Search for text when I start typing". This feature is very effective if you want to search strings in a long file, for example you would like to find word related to alsa in Linux's kernel changelog. All you have to do is turn this feature on and wait until the changelog is fully downloaded and start typing for alsa. A search box will appear in the bottom of the application. A problem can occurred when this feature is turned on. When the page has a form and it hasn't been finished rendering and we type something in the text box to fill our user name for example, sometimes Firefox thinks that we're searching for text and not filling in the forms. Even after the page has been finished rendering, we couldn't fill in the form also. The solution is to turn the feature off again or you will have to refresh the page and wait until it's finished rendering and downloading. Few days ago, i was invited to see a demonstration of another education product from Pintar Learning who developed a product for MATH and SCIENCE. The product were great and i even got the trial version of it. It has been used in several schools in Malaysia (Since the company who made this product is based on Malaysia) and the students were very excited because it became an interactive session, since they use another product which has a function like a white board, so the students can use the pen to do some drawings or dragging an object to the work area and do some task on it. I also showed my finished project, OWG Project, which is also an educational application, but intended for visually impaired children in Netherlands. It still uses Dutch language as the basis. Dec 12: It appears that a large number of users preferentially hit server 1, despite DNS round-robin. Some reports indicate that this may be caused when there is a Microsoft DNS server in between us and the end user (e.g. at the ISP.) Therefore, if you use rsync against our servers, you may want to hit server 2 explicitly (rsync2.kernel.org or mirrors2.kernel.org). Similarly, you might find that you get better performance from www2.kernel.org, ftp2.kernel.org or git2.kernel.org. I never looked at this news before as it is very rarely being updated. Well, at least there has been some mirrors who provide faster access to the latest kernel version. Today i seldom browse the Internet since my work is overloaded with tight schedule, but when i tried to browse the Internet (i even make my YM status invisible), it's quite faster then in the last 2 weeks after the earthquake. I wish everything goes like this (or even faster), but just in a few minutes, it turned 180 degrees. It is very very slow and i can't even open my blog. I guess Speedy is Speedy, but not Steady. I wish they can be Speedy and Steady in the future. This version of MySQL Community Server has been released as a source tarball only; there are no binaries built by MySQL. Lots of thing have been updated/fixed in this version, so if you would like to have state-of-the-art MySQL version, grab this version and compile it with your development tools and you will have the latest version of MySQL. It's their first time to release a release on their public page since 5.0.27 and some people thought they were hiding it. The conclusion is clear: MySQL keep releasing the MySQL community edition, BUT only in tarball and source code version, no more binary version again. If you want to have a preview for Windows Vista, but you don't have the required spec to run the beta version, then try it on web by visiting Windows Vista Test Drive site, provided by Microsoft. In order to use this test drive, you will have to have IE 6 at minimum, and you will have to install an ActiveX component from Microsoft. You will have a display of the next Windows Vista release, but there's nothing you can do much with it, except for watching demo videos, looking at their features, gives feedback, recommend it to your friend, and buy the product. If you are living in a certain areas, then you will have a chance to see the real test drive of some feature of it, but it's limited to certain areas and Indonesia is definitely not included on the area. Finally i have surpassed 100 articles that has been published on PCPlus. It's 101 articles right now and most of them were talking about Linux and Open Source application. I thought this week i could get into 100, but when i looked at my publication page again, it turned out to be 101, so the 100th article was about 1 month ago, since PCPlus is a bi-weekly magazine. I start writing articles since i was in the first semester at college. At first, i didn't have any intention at all, but when my lecture, Budi Sutedjo asked us to write something and publish it on a magazine/newspaper or any other media, i started to write something and that's my first experience writing an article which continue up to now. I got a lot of benefits by writing besides i earned some cash from it, for example i can skip the mid test in several subject whose lecture was Budi Sutedjo, because my article was published and i got 100% for the test itself (i wasn't sure that i will get those points if i had to do the test). Well, i'm still writing articles for PCPlus and now i'm also blogging using Blogger and i have around 900 post up to know. It's like a new hobby for me to write something on my blog. Getting 1000 post is my next target and i think i can achieve that this year. Surpassing 100 and 1000 is not a fixed target as i will always add more targets later on. SAN FRANCISCO, January 22, 2007 — The two leading consortia dedicated to the advancement of Linux® – the Open Source Development Labs (OSDL) and the Free Standards Group (FSG) – today announced that they have signed an agreement to merge and form The Linux Foundation. The new organization accelerates the growth of Linux by providing a comprehensive set of services to compete effectively with closed platforms. Founding platinum members of the Linux Foundation include Fujitsu, Hitachi, HP, IBM, Intel, NEC, Novell, and Oracle. Jim Zemlin, former executive director of the Free Standards Group, leads The Linux Foundation. Other members of the new organization include every major company in the Linux industry, including Red Hat, as well as numerous community groups, universities and industry end users. The Linux Foundation, which continues to sponsor the work of Linux creator Linus Torvalds, employs a shared resources strategy – much like open source development itself – to collaborate on platform development while enhancing the Linux market for end users, the community, developers and industry. Since OSDL and the FSG were each formed more than six years ago, Linux has grown significantly in server, desktop, and embedded usage around the world. Moreover, the open source model has transformed development by providing faster demand-side learning, higher quality, better security, shorter development cycles, and lower prices than closed platform development models. OSDL and the FSG were important forces behind open source adoption and played key roles in preventing fragmentation of the Linux market. For Linux to remain open and attain the greatest ubiquity possible, important services must be provided, including legal protection, standardization, promotion and collaboration. Successful proprietary software companies, for instance, do several important things well: backwards compatibility, promotion, interoperability, developer support, and more. In the voluntary and distributed world of Linux development, the industry continues to successfully use the consortia model to rapidly improve these value attributes for Linux. The Linux Foundation has been founded to help close the gap between open source and proprietary platforms, while sustaining the openness, freedom of choice and technical superiority inherent in open source software. It’s vitally important that Linux creator Linus Torvalds and other key kernel developers remain independent. The Linux Foundation sponsors them so they can work full time on improving Linux. The Linux Foundation also manages the Linux trademark (www.linuxmark.org) and offers developers legal intellectual property protection through such initiatives as the Open Source as Prior Art project (www.osapa.org), the Patent Commons www.patent-commons.org), and sponsorship of the Linux Legal Defense Fund. A platform is only as strong as the applications that support it. The Linux Foundation offers application developers standardization services and support that make Linux an attractive target for their development efforts. These include the Linux Standard Base (LSB) and the Linux Developer Network. All major Linux distributions comply with the LSB. The Linux Foundation serves as a neutral spokesperson to advance the interests of Linux and respond with authority to competitors’ attacks. It also fosters innovation by hosting collaboration events among the Linux technical community, application developers, industry and end users to solve pressing issues facing the Linux ecosystem in such areas as desktop interfaces, accessibility, printing, application packaging, and many others. The merger is pending ratification by the two organizations’ respective memberships and is expected to be completed in early February. “The new Linux Foundation will integrate and advance the activities that have been the most important to OSDL and FSG members. We expect The Linux Foundation will advance the Linux/OSS ecosystem and we look forward to working on key activities including standardization,” said Kazuhiro Fujisaki, general manager, Platform Software, Hitachi, Ltd., Software Division. The Linux Foundation is a nonprofit consortium dedicated to fostering the growth of Linux. Founded in 2007 by the merger of the Open Source Development Labs and the Free Standards Group, it sponsors the work of Linux creator Linus Torvalds and is supported by leading Linux and open source companies and developers from around the world. The Linux Foundation promotes, protects and standardizes Linux by providing unified resources and services needed for open source to successfully compete with closed platforms. For more information, please visit www.linux-foundation.org. Trademarks: The Linux Foundation, OSDL, Free Standards Group, and Linux Standard Base are trademarks of The Linux Foundation. Linux is a trademark of Linus Torvalds. Third party marks and brands are the property of their respective holders. Another proof that Linux is supported by major vendors. It's not only for Geeks, but for all kind of people who are willing to learn the new excitement of using new operating system. I went to my sister's place at night so we could go together to the airport and help her with some luggage that she had to bring to Semarang. I usually go to my sister's place around 8 - 8.30 PM at night, but since it's thursday, so i went there around 7 PM and the street was not as crowded as in Friday (in Jakarta, people often use Friday as the end of the week, so they usually go somewhere in town. This what makes Jakarta so crowded at Friday). Our plane was scheduled to departed at 12:30 PM, and we left at 11 AM to go to Blok M and we planned to use Airport Bus to reach the airport, but since we were quite late, the taxi driver offered a non-argo ride to the airport which costs us Rp. 70.000 (without further charges). I know it's quite expensive, but we had no choice at that time, since airport bus usually waits for passengers also before leaving to the airport, and we're chasing for our plane, so we took that offer. We arrived about 15 minutes before the plane was scheduled to depart. After check-in, we went to the waiting room and we got an announcement that the plane was postponed for about 45 minutes. Argghh... if we knew it will be like this, we would have taken the bus rather than taxi. Ok.. so we wait for about 45 minutes, but there was no sign of the plane was going to be departed, so we waited for about 1 hour and then finally an announcement that we should wait for a plane from Surabaya (so another delay). After the plane arrived, there were still no announcement of when will the plane leave, so some people asked them and they said that the plane couldn't be used since the auto pilot was broken and the mechanics were still fixing them. Ohhh My GOD!!!! After some tough discussion and some were angry too, finally we (the passengers) asked for a plane change and they agreed with it, so we had to go to Gate 1 from Gate 5 to reach the new plane and then we left to Semarang using the new plane. I was picked up by my cousin, Andrew in Ahmad Yani airport. Just for information, this was my first time to go to Semarang using plane. Usually i go to Semarang via JogloSemar shuttle bus or by car, since i usually go there when i was a child and my last visit to Semarang was few years back (i guess it's around 5 years). There has been a lot of changes in Semarang and i already forgotten some of the street name/areas in Semarang. I got into my uncle's house in Gombel and have some rest before a family dinner at night in Holiday restaurant. At night, we went to Holiday restaurant to have a family feast. The event was scheduled to start at 6:30 PM, but it actually started at 7:30 PM and it ended around 9 PM. After this, we were planning to eat Nasi Pindang, but the place was not open, so we go to Gang Pinggir. It's a small china town in Semarang that were quite famous up to now. Usually it's very crowded, but since it's 9:30 PM, we had some room to walk in and have a look on the night view of Gang Pinggir. Too bad i left my digital camera at the car, so i couldn't take a picture on it. I wake up a little bit late today because last night i was very tired. At about 11 PM, i met my girlfriend at Metro Hotel, where she stayed there with her mother. We had chats until around 2PM when i had to go back and picked up my father at Joglo Semar's head office in Gombel. Next, we went back to my uncle's house and take some rest before we went to PRPP, the place where the marriage takes place. It's located in Puri Anjasmoro and near my cousin's house who were married. It's only 5 minutes from his house. We had some family events first at 4:30 PM and around 6 PM, i picked up my girlfriend at her hotel to go the event with me. The event was great and i liked it. The party itself ended at about 10 PM and during that party, i received good news that Liverpool beats Chelsea 2-0 and tonight, MU will face it's rival, Arsenal. Today i had to wake up early in the morning since my plane was scheduled to leave at 8.30 AM. I woke up at about 6.30 AM and then preparing all my stuffs and left to the airport at about 7.30 AM. We arrived at the airport, checking in and the officer said that the plane was already in place and ready to go, so there was no delays again. We used Batavia Air this time and the flight was so smooth. It even flew few minutes before it was scheduled to leave, so it's earlier than in the schedule. At 9:15 AM, i already landed in Soekarno-Hatta airport and went back to my house and then start posting this blog. One note about Ahmad Yani airport is that they have provide a free hot spot on it (too bad i didn't bring my laptop, so i couldn't use it). I just hope that Adisutjipto and Soekarno-Hatta will also provide this services in the future. Starting tomorrow, i will be out of Jakarta for 3 days. I will be in Semarang for my cousin's marital party that will be held at Saturday. A night before the party, we shall have a feast to celebrate it with the rest of the relatives, including me and my sister. I will be coming back to Jakarta at Sunday and at Monday i will go back to work normally. Luckily that my project is now finished, so i can leave it for one day and i'll come back again at Monday. What surprises me is that my girlfriend will also be in Semarang during that day, because she has to accompany his mother in Semarang for singing contest. I wish i could see her, since i will have busy schedule in Semarang. It's been a while since my last visit to Semarang and meet my relatives there. I think it will be a great time to meet them. I don't think i will have Internet connection there, so perhaps no post at my blog for about 3 days and also i won't be able to read my e-mails, so please be patient if you sent me a message. Since my project is now considered finished, i'm starting to translating my project into English version (originally in Dutch). Usually, i'm translating to Indonesian language, but now, i have to translate into English from Dutch. In some cases, i used Babel Fish Translation from Altavista, but sometimes the translations becomes fuzzy, so i had to ask for my colleague's help to translate it (he's from Belgium, so he knows about Dutch language). There are about 1000 strings to be translated, but luckily not all of them are filled in, so it's less than 1000 strings. The problem is to find the best words to reflect the original string so it won't change the meaning. The website contains currently 82 help topics with 51 screencasts for OpenOffice.org Writer, 3 screencast for OpenOffice.org Impress, one screencast for OpenOffice.org Draw, one screencast for OpenOffice.org Math, 24 screencast for OpenOffice.org Calc, one screencast for OpenOffice.org Base, and 96 glossary terms. The only thing you need to access this website besides browsers are Java Plugin. Plan-B™ is a new technology that documents software with short videos (screencasts) and offers smart search technology for improved indexing. This service allows anyone, especially non technical users, to find answers to their questions quickly and to understand the documentation effortless. Here's one of the example which shows you about Find Using Wildcards in Regular Expression. # [Sec] Fixing possible negative start parameter - SpiderZ. I hope no major problems happened after the upgrades. If there's any problems regarding the avatar, smilies, please let me know, since i unintentionally deleted some of the files in the images directory when i wanted to delete the install directory, but since Ronny Haryanto has made a backup, i can easily restore it. Yesterday, our office had an electricity problem again. The electricity was down for about 2 hours and that happened during office hours in 1 block area. Luckily i'm using laptops, so i could still continue working, but those who used PC wasn't that lucky so that their unsaved work will screwed up. The electricity goes up again at 4.30 PM. Not Ready To Use Open Source? 1. The government's computer needs to be upgraded. I was laughing when i read this ridiculous reason, because actually we are ready to do that. It's not about technical issues, but about the mentality of the human resources itself. Since the government has also IGOS project and Minister of Research and Technology has said that IGOS is ready to be used, why don't we start using it? It has been developed very well and i don't think all GNU/Linux distribution/application requires high specification for computers (well, some does, but only a few of it) and upgrades can be done partially with the workstation that uses the most critical application comes first. Does an office workstation needs to be upgraded to the state-of-the-art specification just to use GNU/Linux? I don't think so. If they want to use Windows Vista, then it may be correct. Vista does requires high resources. In GNU/Linux, we have plenty of choices about Window Manager. If you don't have too high specification, don't use KDE/GNOME. Use IceWM, Blackbox, FluxBox, XFCE, etc. The same case applies to applications. Talking about human resources, i think it's about habits. They gets strange feeling when they use Open Source because they never tried that before. When they have started to get a grip on it, everything will come back to normal as before. Let's take an example of the most common application being used in the governments which is office application suite. OpenOffice.org has been proven stable and it's being recommended by many big vendors as it supports for OpenDocument Format (ODF), which has been approved as ISO and IEC International Standard. Munich and Malaysian government has dare to migrate their documents to ODF format, why can't we? How long do we have to wait for standardized national format? About lack of printer driver in OpenSource, i don't know too much about it, since i never tried to probe printers in my Slackware system, but as far as i know, CUPS project has maintain a lot of drivers for various printers. Buying TurboPrint license is cheaper than having to pay for Windows' license. I'm sure there will be a lot of post about this also in the next few days. "One of the big costs the DET always faces when changing platform is retraining -- because we have 1.2 million users. Traditionally we try to make the new platform look like the old platform as much as possible. "Clearly some of the changes to the user interface may well be things that users find attractive. In that case we will have to include the cost of implementation and training as part of the [Vista] rollout". Someone post a question in oooindo mailing list on how to install the Indonesian dictionary in OpenOffice.org application. I used to do this also, but since i have forgot, i tried to find the answer in the Internet and after i found the answer, i decided to post it also in this blog, just in case i forgot it in the future or perhaps it could be usefull for someone who needs this information also. As you know, in the old version of OOo, we had to install the dictionary in OOo manually if we used a non-default language in OOo (for example we used Indonesian language in English Build of OOo), but in the current (and future) release of OOo, it has been changed into a built in dictionary installer called DictOOo which has been developed by Laurent Godard and which has many more features, and is more compatible, than the latest version of DictInstall. 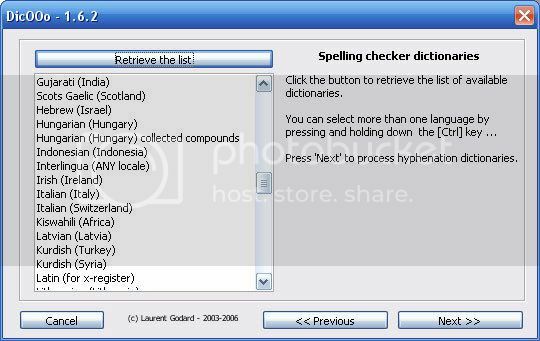 To access DictOOo, choose the File > Wizards > Install new dictionaries.... It will open up a document (first picture) and from this document, you can choose which language dictionaries do you want to install. (Remember, you must be connected to the Internet to do this as it will download the files directly from Internet). Update (15 January 2007 09:49 AM): It's possible to do this installation manually, but you must download the packages directly from the Internet first. In Windows, you must put your extracted files into C:\Program Files\OpenOffice.org 2.1\share\dict\ooo (in case you install OOo 2.1.0 and put it in the default directory) or in ~/.openoffice.org2/share/dict/ooo (~ means your home directory) if you are using GNU/Linux (Thanks to Justin Waruwu for his information). 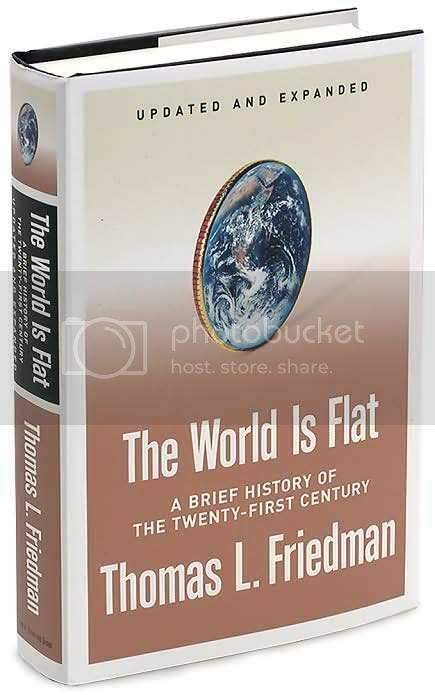 Thanks to Wikimu, i have received a present of the latest book of The World Is Flat [Updated and Expanded]: A Brief History of the Twenty-first Century (Hardcover) by Thomas L. Friedman. The front cover is not the same as i seen in Wikipedia (maybe because the image uploaded in Wikipedia is the original 1st cover and what i got is the latest version). The book was sent last Friday, but i just received it today. The book was first published with a jacket that bore a painting, called "I Told You So", depicting a sailing vessel falling off the edge of the world. The week the book came out it was learned that the publisher had not obtained the artist's permission to use the painting. Farrar, Straus and Giroux printed a new cover using an image of the earth literally flattened like a coin from the Corbis stock photography library. In an interesting twist, because the book had rocketed to the top of the nonfiction New York Times Best Seller list, the new cover also includes the text "National Bestseller", something common for paperbacks but highly unusual for first edition hardbound covers. Friedman believes the world is flat in the sense that the competitive playing fields between industrial and emerging market countries are leveling. Friedman recounts many examples in which companies in India and China are becoming part of large global complex supply chains that extend across oceans, providing everything from service representatives and X-ray interpretation to component manufacturing. He also describes how these changes are made possible through intersecting technologies, particularly the Internet. Another book to read besides Deception Point from Dan Brown (i have read it and now i'm re-reading it again) and also The Golden Compass (originally called Northern Light) which my girlfriend bought me when i was in Jogja last year. I do like reading books, including comics and novel and sometimes i buy them for my own private collection. My sister also collects a lot of novel, mostly Agatha Christie's novel. As you can see in this week post, most of my posts were about complaints about the ISP being used in my office. It's very slow during office hour and even in morning/night, it still couldn't access some site (mostly site that was being hosted outside Indonesia). I (like the other) had contacted the customer service several times until finally we get bored of it. Last friday, i called the customer service again and the operator said that she would make a report on this one and yesterday, i got a call from the ISP operator (luckily that i was in the office that day) saying that the impact of the earthquake is still effective, since the cable is not yet fixed 100% and since the ISP has re-route their connection to Europe (i guess), it will cause some delays and RTO (Request Time Out), mostly during office hour. She also said that it will come to normal again (just like before the earthquake) in about 3 weeks (now, that's a bad news). So, if you encounter what i had (even though you are using different ISP that i used), don't be surprised to experience it in another 2-3 weeks (perhaps it will be quicker, since the cables are being repaired as fast as they can). Things will come back to normal next month. After batling for 3 days, finally i managed to finished another Mystery Case File, this time is MCF Ravenhearst. 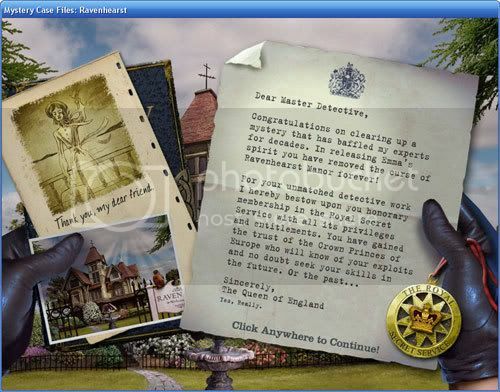 In this game, you will have to find clues via diary entry of a person called Emma Ravenhearst which haunted Ravenhearst manor for years. As usual, you will have to find hidden things and after that, you will have to rebuild a small jigsaw, which describe the condition of Emma when she wrote her diary. The hardest puzzle was the last one. I had to retry several time before i can passed that one. A little careless will force you to restart the level again and since there's no time reset, you will have to keep on clicking to make the time to 0. Actually, i have downloaded this game last December, but i forgot to bring it home while i was having my holiday, so i can play it after i get back to Jakarta. Even more lucky, i managed to copy this game before my laptop's HD was dead that leads me to change to another laptop. Today, i finally finish solving Copy Minder issue which bothering me in the last few days (it started this week actually). With better Internet connection at Saturday, i can do better testing and as the result, the Copy Minder protection is ready to be validated by my client. At first, i thought that there were bugs in Copy Minder, but today i realize that it's not a bug, but it's my fault. This is my first time using Copy Minder, so i'm quite confused on how to work with it. The included CHM file is only giving a little explanation on the implementation of the protection itself. So, i have to browse their web page for more clues, but it's impossible if i do that in office hour when most people were accessing Internet for their works also, so i choose Saturday, when most people don't come to the office. And finally i found the solution for my problem. I did a little experiments and it worked fine. Good news. I will have further testing next monday and hope to send the updated modules to my client and when it's done, my project can be considered finished and start on other project which is already waiting for me. Today, the Internet connection at my office is horrible. Few minutes online, and then offline for few hours. That happened not only today, but for this whole week. I have called Speedy's customer service (via 147), but it's not getting better, even after office hour which usually gets better. They said that the connection has no problem at all, but in reality, it does have problems. Unfortunately, my work currently does need Internet access badly, like as i said in my previous post. Without Internet access, i couldn't do anything with it. I tried to put some documents on my account at my campus, but it's also slow, even though we both using the same service from Telkom (my campus is using Astinet). This document sets out the feature set, product requirements and prioritization for the development and release of Firefox 3, code-named "Gran Paradiso", presently under development with an expected release in Q3 2007. This page also listed some big feature list, but unfortunately, making firefox faster and fixing memory leaks (Firefox sometimes reported to consumes too much resources) are not listed there. Well, Firefox release is always phenomenal, so let's just wait for the release of Firefox 3 (aka Gran Paradiso). Most of the cases, i have to be online to do the checking. While the Internet connection in Indonesia is not very stable currently, i sometimes had some problems on testing it, so sometimes, i had to come earlier in the morning or waiting for my colleagues to go back from the office first before i start testing it again. then support in email clients is moving at a glacial pace. solid rendering engines, things have been looking up. that is built into Word 2007 to display HTML email messages. issues that would be resolved in the final release. support available in Word 2007 is available in Outlook 2007." that designers producing HTML email will not be able to ignore. Why on earth would Microsoft do such a thing? Security? Bring on PDF email. I'm ready. It's a major drawbacks since IE7 has become better (NOT the best, but better) in HTML rendering than previous version and the IE team has worked to get most of CSS and HTML standards implemented in correct way in IE7 and finally Outlook team dump them. After configuring my new laptop, i tried to checkout some project that i worked for using CVS/SVN via Cygwin, but unfortunately, the access is very slow. I don't know whether the source of the problems comes from the ISP or from the repository. I can checkout ooo-id and slackbook project successfully, but i'm having problem to checkout mdk-id project. For OpenOffice.org's project, i only checkout the index.html file, since there's so many files inside the OOo's repository so it take so much space and time to get them all checked out. Update (11 January : 8:34 AM): Finally i managed to checkout all of my open source project again. Let's start working on it as there's has been some updates on it. This post is made after hundreds of time of pushing F5 button to refresh the page. Today i start working at my office again, but already 1 bad news for me, which was my laptop's HD was broken, so i had to switch to other laptop and re-install everything again. It's not a perfect way to start new years, but there's no other way. Perhaps i will spend all this day and tomorrow installing applications needed for my daily activities. The good news is that the laptop's spec is higher than my previous laptop, so i can install most of them faster than before. I was sitting at the adisutjipto airport while i wrote this post, looking for a hotspot, but unfortunately, i didn't find one. I thought there are hot spot in this aiport, since there's something at the ceiling which is the same with the thing that i saw in Galeria few days ago. I thought this indicate that there are hot spots in this airport, but when i tried to browse for the available wireless networks, it couldn't find any, so i guess, it's not a hot spot antenna or probably they didn't activate it. Too bad, since really want to test the connection and also post this blog. The renovation of the airport has been finished and it's bigger, more comfortable (thanks to new waiting seats, new TV screens, but also new ads around the building), and more clean then ever (even though it cannot be compared to other international airport in other countries). One thing that i like this airport compared to Soekarno-Hatta is that it only has 1 entry point, so it's not confusing at all, but the disadvantage of this is the maximum capacity is lower than in Soekarno-Hatta. But i think the seats are still adequate for most cases (except for special circumstances), because the traffic of this airport is quite crowded, so people came in and out so quick. There are a lot of foreign people who traveled to Jogja as far as i seen in this airport. Sitting in front of me are people from Korea (i guess) with a small kids sleeping in his baby car. Lucky me that i don't have to carry too much things at my bag, except for Bakpia for my colleagues. Well, i think i will enjoy the flight and hoping that there won't be any bad weather while i'm on the flight and i can arrive safely at Soekarno-Hatta airport. I will update this post when i reached at my place. Update (21:55 PM): I finally reached my place. The plane was delayed and i took off at 6.30, 30 minutes behind the original schedule along with other airways too. I arrived at Soekarno-Hatta airport at about 7.25 and i took an airport bus (Blok M) to get me to around Slipi Jaya and then from there, i took a cab to drive me to my place. The bus rate was still the same, Rp. 15.000, but unfortunately, i didn't get the nice driver. The bus also took so long to pick up passengers, while we had to wait until the bus was almost full before he start driving to Blok M, the last destination. When i got home, my room was so dusty (i left it for about 2 weeks or so), so i start cleaning it, including changing my bed cover. After all was done, i start updating this blog and here's the final result of my journey back to Jakarta. After talking to Yahya Kurniawan in YM, he told me that the problem was due to a broken trafo in Ungaran (near Semarang) which has a capacity around 500 mVA that supplied electricity for Jogja and Central Java (he heard this from a radio). When that trafo is broken, most of areas in Jogja and Central Java will have blackout. What confuses me is that the local governments has hold a campaign to save the electric in the TV, Newspaper, and many more, but they build a gigantic TV screen near Garuda Hotel fthat used a lot of resources and also bringing so many unused lamp (except for entertainment) under the campaign banner. 5 April 2007  | Final devel freeze. FC7 release does bring major changes, but it still needs more help from YOU. Give your best to help Fedora 7 release if you are trully Fedora's Fans. NuFW is a next-generation firewall that includes exclusive features which offer new authentication and user-tracking possibilities. For the first time, it becomes possible to define and use a filtering policy based on the user identity, not on the IP address. With conventional firewalls, filtering rules are, by design, limited to matching on concrete technical specifics: IP address, ports, etc. NuFW brings new capabilities by bringing the notion of user identity to the security rules. This authentication is made a posteriori, so NuFW never associates an IP to a user. The firewall sees not only computers (IP addresses), but also users as the source of network traffic. Filtering rules are not based on just computers, but truly on users or groups, so that the security policy can be strictly enforced, for wired or wireless networks. Furthermore, NuFW provides an elegant and secure framework for building single sign-on solutions. The fit is natural because it is the gateway, which all traffic must cross, which centralizes and responds to authentication requests. NuFW won the security category of 'les Trophées du Libre 2005'. NuFace (the ACL management tool) and NuLog (the log management tool). Today i went to the travel agent that sell me the ticket to go to Jakarta to re-issued my ticket again, since i had canceled my ticket since my father was ill and i still have 1 month to re-issued it again before it expired. When i canceled this flight, i was told that i can re-issued it again but i have to pay Rp. 50.000. Today, i had to pay more than that, since the there are no available seats that have the same class as mine, so i have to upgrade my tickets to higher class in order to get the available seats and that means i had to pay more. The problem is not about the money, but about the services. Some airways use classes to differentiate the price between their tickets, but at the end, nothing is different. You get the same snack (only several airways give snack on the plane), drink, tight seats, and services. So, what's the advantage of paying higher classes if we (the customer) don't get any additional services? The tickets had been confirmed and i will leave to Jakarta on Sunday at 6 PM. Hopefully there won't be any bad weather. CAMBRIDGE, Mass.--(BUSINESS WIRE)--One Laptop per Child (OLPC), a non-profit organization with the goal of providing laptop computers to all children in developing nations, today announced a breakthrough user interface (UI), called Sugar, for OLPC's innovative XO laptop computer. The Sugar UI, jointly developed with Red Hat and Pentagram, is the first to have been purpose-built as an educational environment for children using laptops. It is designed to support the learning experiences of elementary- and secondary-school children in poor, often rural communities by providing them with opportunities to freely explore, experiment and express themselves. The Sugar UI promotes collaborative learning through child-to-child and child-to-teacher sharing. The realities that OLPC's XO laptops will be used by children of varying ages, nationalities, and who have little or no prior computer experience, were critical considerations when designing the UI. As a result, OLPC created Sugar to be simple and intuitive without limiting the complexity of ideas that children may explore or express. 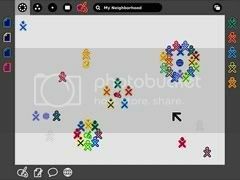 "The desktop metaphor familiar to most laptop users today may make sense in business settings, but it's not geared for children collaborating with each other and their teachers," said Walter Bender, OLPC's president of software and content. "With Sugar, we've created something wholly new and suited to the way children understand and describe their world and relationships. Most importantly, Sugar is easy for children to learn to use, yet it's also rich and capable of fostering unbounded discovery, learning, and exploration." This morning, i still had very bad Internet connection at my house. Even though i'm using dial up, i used to access most site without any problems, but since the earthquake, everything seems to be broken until this night. When i tried to access new Blogger, finally it can display the correct login screen. That means, i can access my Blog also (which i couldn't in the last 2-3 days) and also post some things on my Blog. So far, i don't have any problems opening some sites again and i do hope that this will last in the next days so i can assume that Internet connection at my ISP has been recovered (even though it cannot be considered 100% recovered). It's a good sign to start new year with better Internet connection. I think most people will agree on this one as many people has suffered from the disrupted Internet connection after the broken underwater fiber optic cable. Is your company planning to migrate to Open Source like the other (like Nurul, Vavai, and many more....)? Perhaps the most difficult problem to be solved is to find the perfect alternatives in the new operating system (in this case it's GNU/Linux). Only a bit of application which can work without any difference in two platform (most of the case is build using Java). Using Wine is not the best way, since not every Windows program can be executed perfectly with Wine, but it's worth to try. When you do need help, this site might help you: OSALT (OpenSource as Alternatives). It lists a lot of Open Source alternatives which you can use after the migration process. It may not the best one, but so far, every application submitted is very popular and some of them are also available on Windows platform. You can also submit a new application if you find an application which hasn't been listed there. If you look in the MySQL download page, then you will see that the latest version displayed is 5.0.27. It's kindda weird, since MySQL development usually never took so much time to release another version which fixed bugs from previous version. But when you look at the MySQL's FTP Site, , you will see that there's an update for MySQL. So, our first guess is that MySQL hasn't update their Download Page, but it's not logical, since MySQL has released 2 updates, 5.0.28 and 5.0.30 (can be seen in the FTP site), so they should have update their download page. As you can see, this applies both to binaries (which is expected with new policies) but also to the source files which were promised to be available. But in reality nowadays, the community never get their result. MySQL didn't publish their FTP site at their download page, and most users that needs to have binary version of newer product will have to build it from the original source code. Is it time to migrate to PostgreSQL? At the end of the 2006, my girlfriend's computer was infected with a new local virus which was very nasty. It displayed a prompt dialog before Windows opened, and then when loading the desktop, it disabled some features, for example, CTRL + ALT + DEL combination, Run button, Log Off button, and even worse, Turn Off Computer button. It also change some text on the start menu, for example My computer has been changed into Baboon's Computer, My Documents into Dokumen Baboon, and Recycle Bin into Baboon Suka Kebersihan. What a strange virus. It also make your space disappear so fast, since it replace your files into EXE files and makes it hidden (the original file), so all your files were being replaced by EXE files, which has been infected by the virus itself. It also disable some anti virus application, so you won't be able to scan it. This virus also works in Safe Mode, so it makes even harder to remove this virus. Perhaps the fastest way is to re-format the harddrive and install a fresh operating system on it, but before that, i need to save some of her important data. Luckily, my girlfriend had a Ubuntu CD which i gave here few months ago, so i used it to copy the files into other computer and yesterday, i reformat all of her harddrive and reinstall Windows again. This is when LiveCD Linux distribution like Ubuntu, Kubuntu, Knoppix can come as a hero and it did. What a bad day to celebrate new year. Right now, hotspots are being placed in some malls in Jogja. As far as i know, in Plaza Ambarukmo and Galeria, there's a free Internet access which can be used freely. In Plaza Ambarukmo, you can access it in the Food Court, while in Galeria, you can access it anywhere, since it's placed on the ceiling on each floor. It's provided by XL or Indosat as far as i can see, since there's a logo for their company. A lot of things had happened last year and still many more will come in the upcoming years, so let's prepare ourself to work harder in this new year and focus on our target.